← A Base By Any Other Name? If we needed reminding, the extent of media coverage of Shamanov’s narrow escape from Saturday’s horrific head-on collision proves again that this two-star general is a national figure. So what happened? 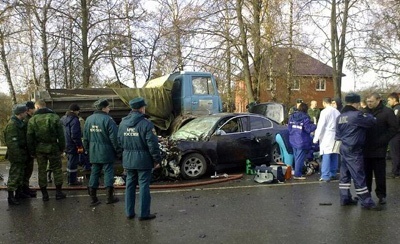 Shamanov’s warrant officer driver was killed; some press is saying he turned the car to take the blow himself and protect the boss. 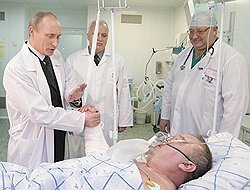 Shamanov was in serious, but stable condition, and was moved from Tula to Moscow’s Burdenko Main Military Clinical Hospital. Also injured were the acting commander of the VDV’s 106th Division, Colonel Aleksey Naumets, and Shamanov’s assistant Colonel Oleg Chernous. Naumets’ condition is serious, but Chernous has improved a little. Shamanov was in satisfactory condition this morning, and he went into surgery at 1200 MSK. The focus of today’s operation was the general’s left leg. Reports say Shamanov suffered a concussion and unspecified fractures to his arms and legs. One has to wonder if Shamanov can rebound from this. He might, but he might not be the same. It would be surprising if he’s able to resume his regimen of jumping with the troops, etc. He’s 53 and faces retirement on age grounds in a couple years unless he adds another star. If he emerges from this accident with any kind of disability, he could be put out for that reason. Of course, it all comes down to whether the powers-that-be want him in or out. And this story wouldn’t be complete without possible conspiracy. More than a couple commentators wonder if someone isn’t out to eliminate Shamanov . . . could be his son-in-law Glyba’s enemies . . . could be airborne veterans who might object to his slavish support for Serdyukov. The Defense Ministry denies that anyone was out to get the VDV Commander. It might just be an accident. This entry was posted in Military Leadership, VDV and tagged Anatoliy Serdyukov, Vladimir Putin, Vladimir Shamanov. Bookmark the permalink.